Subtitling itself as a "Craft American Sandwich Shop," Butcher & Brew sits adjacent to South Main Kitchen in historic downtown Alpharetta. From the same Maven Restaurant Group that brought forth South Main Kitchen, Butcher & Brew opened August 20, 2016, for VIP guests, and began dinner service August 22. Full service, including weekend brunch, will debut a week later, on August 29. Chef Christy Stone from South Main Kitchen also helms this operation. With 20 craft brews on tap, Butcher & Brew is sure to be a hit. 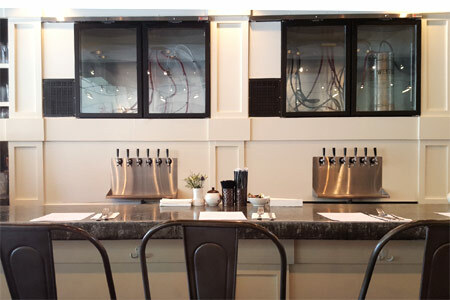 Butcher & Brew, 3 S. Main St., Alpharetta, GA 30009, 678-585-3344. Atlanta restaurateur Ricky Walia, who gained fame with his Masti Fun Indian Street Eats in Toco Hills, just opened Bombay Brasserie in Roswell. Following quickly thereafter, he again steps outside the Perimeter joining forces with the Thakkar Group to take over a large space, once home to Urban Spice. But this venture blends Indian cuisine with Latin American fare, affording diners an international fusion of cooking and culture. “My love for Indian cuisine is well known,” says Walia, who adds: “But I also love foods from South America, Central America and the Caribbean, and I want to incorporate elements of all of those into an exciting new experience unlike anything Atlanta has ever seen or tasted before.” Affairs features a traditional tandoor oven as well as a sigri, a small, open-flame stove, and the menu promises a plethora of aromatic dishes, including biryanis and dals (lentil stews). Lunch & Dinner daily. Affairs, 4120 Old Milton Pkwy., Alpharetta, GA 30005, 678-566-0169. Clay Harper and Mike Nelson, who own La Fonda Latina and Fellini's Pizza, launched The Greater Good Barbecue in 2011 in Tucker, followed by the Buckhead location in 2013. On August 10, 2016, the team opened a third branch in a new development called Hosea + 2nd at the intersection of 2nd Avenue and Hosea Williams Drive in Atlanta's Eastlake neighborhood. Now revitalizing, the Eastlake area is a prime target for redevelopment, and the new enterprise, which is one of several restaurants in the project, is the first to open its doors. The Greater Good Barbecue, Hosea + 2nd, 2358 Hosea Williams Dr., Atlanta, GA 30317, 404-377-0044. After months of archiving historic images and items, and lots of renovation, Manuel's Tavern, watering hole for students, politicians and former presidents occasionally, has reopened with dinner service. Lunch is soon to follow. The spot is nearly sacred turf for many Atlantans as, after 60 years in business and despite much wear and tear, it had become much beloved. The reopening on August 6, 2016, was timed to coincide with its 60th birthday. Manuel's Tavern, 602 N. Highland Ave. NE, Atlanta, GA 30307, 404-525-3447. Rising Son in Avondale Estates, a 1920s suburban Atlanta town, has been a hit with locals for breakfast and lunch, and will start dinner service on Wednesday, August 17, 2016. Offerings will include a steak and a frequently changing menu of comfort fare, all at neighborhood-friendly prices. The wine list will be slightly expanded in support of the new mealtime. Rising Son, The Tudor Village, 124 N. Avondale Rd., Avondale Estates, GA 30002, 404-600-5297. On Saturday, August 6, 2016, Double Zero Napoletana closed after dinner service at its Sandy Springs location (5825 Roswell Rd. NE) to get ready for its move to the space formerly occupied by Ink & Elm (Emory Village, 1577 N. Decatur Rd.) across from the entrance to Emory University. Because parking is so limited there, the restaurant promises valet parking. The company hopes all will be ready by the end of August for its reopening.